Share the story behind the design, development and launch of Podio – what were the greatest challenges you faced? We started as just three guys in a basement in Copenhagen, with some Thin Lizzy records and a generous coffee shop next door. We had actually worked together on some collaboration and social software projects before starting Podio, and we discovered that the adoption of these social tools depended heavily on the amount of ownership people took. So, the process of starting Podio was very much about solving that challenge, making prototypes and testing those to see the reaction of users. I even made a physical App Builder – a sort of game board where you could build apps and map your work flow and processes with various playing cards, we used that for prototyping, and it helped us understand what people really wanted to achieve. We started Podio, because the way we work was broken. We wanted to empower people to work the way they want, which is in a more collaborative way, with workflows tailored to their needs. We found out that the only way for that to happen was to give the power back to the people who do the job, by creating a tool that enables them to define and build their own workflows and processes. With this the Podio App Builder was born. Six month after our launch Podio users have build or modified more than 200,000 apps, to get their work done, in their own way. The company was founded in 2009 under the name ‘Hoist’ – what led you to change the name? In your opinion, how important is a name to the success of any startup? Your company name is crucial in two ways; what it means to you and what it means to the world. In a startup it’s all about getting people moving in the same direction, and the name you pick is important in making that happen, it’s where a lot of your identity is born. Secondly, there should be a story associated with your name, the story you are going to tell everyone about what you do, why you do it and for whom. With Hoist the story was that people used to hoist sails as a team, it was a team effort, and a great example of working collaboratively. But, we found that the sound of Hoist was too hard in some languages and we could’t get hold of the .com domain. So, we went on the look out for a better name with .com available. That’s when Podio came up. Podio means platform in latin and it really underpins our ambition: we want to be the platform for work. A platform, or a podium, for individuals to take charge of their work and processes. It’s sort of a stage where everyone can perform. Podio also has a pleasant sound and can be pronounced in most languages without sounding foreign or awkward. So, the decision to change name was not as hard as you might think. Now people working for us and the most vivid fans refer to themselves as “a Podio”, and of course our band is called “The Podios”. If your company has an original long term vision, or a long lasting commitment, your name should be long lasting too. I would say that real words (or compounds) are more trustworthy in that case. You can play around with words, dropping certain letters in order to get a .com domain, but you will most likely end up having to spell it out every time you talk to people, and that’s a bad start. Podio employs a freemium pricing model – can you shed some light on your decision making process in regards to monetization? What options did you consider? From the beginning we wanted to have paying customers. We were self-funded and needed revenue, but more importantly we wanted customers to validate our pricing. You can read thousands of books on this, but nothing beats stating your price early on to get a reaction from your potential clients. Where to put your upgrade trigger points really depend on your market, competition, and so on. One tip is to avoid only focussing on the free part, instead, spend equally or even more time on the ‘Mium’ part of your offering. Make sure you don’t cripple the free version, so that it becomes useless for it’s audience, and then look for strategies where the premium version is a logical extension of the free. Podio has grown at a rapid rate, with over 23 employees now at the company. How did you approach the hiring process? Can you offer some advice to fellow entrepreneurs regarding this challenging area? This is one of my favorite areas. You will only make a difference with a great team that is motivated. First of all, your vision has to be bold and brave. That will help attract the right people from the out set, and it will get you the right amount of critical questions from the start. From the early days we had some really bright people involved, for example Thomas Madsen-Mygdal, who made an early seed investment in Podio (back then Hoist) and has been involved ever since. When you work with people that share your vision, your vision will be amplified and further refined through what you do. This is also where your culture is formed, half of it is what you do and how you do it, the other half is aspirational. This is the foundation for the hiring process. We had Kasper Hulthin join us while we were still in a basement in stealth mode, and we build a revenue base, even before we launched. From there on, Tommy Ahlers joined as CEO. He had recently made an exit with his company ZYB to Vodafone, and had tons of experience, also in growing teams. Together, we managed to get onboard some of the greatest talent from all over Europe. Today we have 11 nationalities in our office in Copenhagen. And we recently opened up our US office in San Francisco. If you look at yourself as a multinational company from the beginning, even when you are two or three guys in a basement, it will make recruiting easier for you down the road, especially if you start out in Europe. 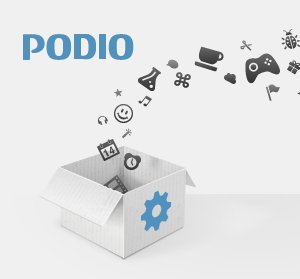 Mobile applications form a critical part of Podio – how central were they to your planning prior to launch? Are mobile applications crucial to the success of a modern consumer-focused startup? Well it’s all about timing and resources. Podio is a web based platform for work, it’s all your workflows, processes, contacts, and communication in one place. It’s also where you shape and build your workflows with our App Builder. Making all that mobile is not a trivial task. Secondly mobile is often viewed as an extension of a web experience. But when looking closer, your mobile behavior and needs are quite different from your web behavior and needs. There is a lot of overlap, but it’s not an extension as such. So, identifying the differences is vital. For example, in Podio you might need a different way of organizing your work depending on what device you are on, maybe you need something on you mobile that you don’t have on in the web version, and vice versa. What is the single most important piece of advice you would offer to an aspiring entrepreneur? If in doubt, do it. Then, get bright and experienced people involved from the start, and tell them what you want. Someone once said “It’s not about who you know, it’s about who knows you” and I like to add to that “and do they know what you want?”. It’s also crucial to know the space you are in and exactly what value you create. Is the need widespread or is it confined to your friends? Get your prototype or beta out and test it with real people, not just the ones you know will like it.